Dana Holdings is one of Europe’s leading investment and construction companies. It is known for its large international projects and ambitious ventures, which have been implemented throughout Eastern Europe, Russia and the former Soviet republics. Its multifunctional residential complexes, with their ‘city within a city’ format, have swiftly become extremely popular. Dana Holdings’ largest and most ambitious construction scheme to date is the biggest single development project in the whole of Europe: dubbed Minsk World, the multifunctional residential complex located in Belarus is a game-changer for the country’s economy. The project’s location in the centre of Minsk reflects the city’s position in the very heart of Eastern Europe. In addition to Belarus’ advantageous geographic position, the country’s sustainable development and diverse investment options – from agriculture to IT – were important factors in deciding the project’s location. The three million square metre Minsk World is made up of 24 quarters that are each named after famous people, countries and significant achievements in history. Though construction of the mammoth project only began in 2017, two quarters have already been built, with people currently living in the first. 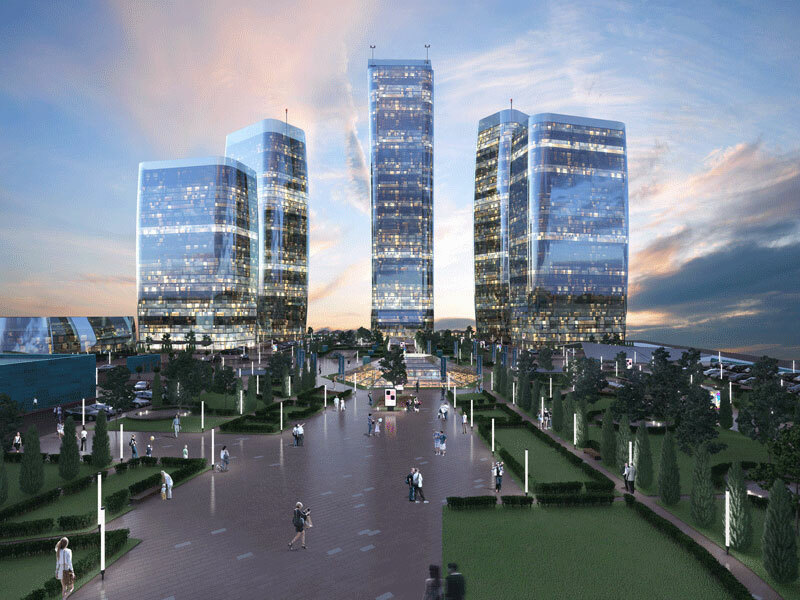 The main feature of Minsk World is the international financial centre, which will be located in the centre of the complex and will be fully integrated with the city of Minsk and its infrastructure. The international financial centre has been modelled on the examples of Dubai, Singapore, Hong Kong and other world-class financial hubs. The ambitious project started with a vision to allow Belarus to take a leading role in the region’s economic development. Though part of the country’s economic zone, the international financial centre will enjoy a special system of benefits and incentives to attract capital and provide financial services. Dana Holdings believes that, thanks to these incentives, Belarus can become the most competitive and interesting country for investments on the continent. In 2018, I signed a memorandum of understanding on behalf of Dana Holdings with His Excellency Essa Kazim, the chairman of the Dubai International Financial Centre. It stated that both parties would share best practices and cooperate in the fields of design, development, function and operations. In 2018, Dana Holdings started the construction of a new multifunctional residential and business complex in Astana, the capital of Kazakhstan. Named Tesla Park, it will cover a total area of 1.5 million square metres and will include all the features needed in today’s modern urban spaces, such as social facilities, kindergartens, schools and sports centres. On October 9, 2018, a ceremony took place at Tesla Park, during which President of Serbia Aleksandar Vucic´ and Prime Minister of Kazakhstan Bakytzhan Sagintayev placed a time capsule at the site of the project. The message inside reads: “Friendship between the residents of Kazakhstan and Serbia is one of the brightest pages in the history of the centuries-old relations of our fraternal peoples.” The mayor of Astana and the ministers of both countries also participated in the historic event. Astana was chosen as the location of Tesla Park largely because of the vast scope of the capital’s potential. Over the past 20 years, Astana has grown from a town of 150,000 inhabitants to a city in which more than one million people live. Its population is expected to reach two million people in the next 10 years. Situated halfway between China and Europe, Astana is like a mini Dubai, and has great prospects both geopolitically and macroeconomically. It’s extremely interesting from an investor’s point of view. The main goal of the Tesla Park project is to conquer a segment of the market that is absolutely free at the moment – namely, property functionality and apartment design. Nowadays, dynamic lifestyles demand functional apartments at prices that are affordable for businesspeople. This is where Dana Holdings comes in. Contemporary planning is our company’s main focus – it directly impacts city economics and can attract a young, talented workforce into an area, thus supporting urban growth and development. Architecturally, Tesla City is arranged in a circle to create a concentration of activity. The rooftops of the buildings are cleverly designed to face the sun, forming a huge diadem that’s visible across the city; we believe it will become the new symbol of Belgrade. Offices and hotels are included in the project’s composition, forming an integral part of the complex. The Belgrade International Financial Centre will lie at the heart of the Tesla City complex. With various business and entertainment facilities surrounding it, it will be the perfect combination of practicality and profitability. We believe that Tesla City and its international financial centre will turn Belgrade into a key economic player in Central Europe. The Tesla City project is indicative of the harmonious development of Belgrade. It is carefully linked to the natural environment and is well balanced with the prestigious history of the city. Through its connection to the historic centre of the city, it will contribute to the revitalisation of urban activity. The complex will host a range of activities, from business meetings to large-scale events such as concerts. Its versatile event space is set under a wire cloth canopy, and upon completion will be an outstanding feat of architectural design. The complex will also have an aquarium, a high-end shopping mall and many restaurants. Additionally, Tesla City will have a swimming pool that can be used as an ice rink during winter. Each aspect of the project will be connected by a metro station located within the development, making it convenient and efficient to negotiate. Set against this unique concentration of businesses, hotels, retail options and event areas, there will be residential districts comprising multifamily housing, townhouses and individual homes located along a network of beautiful avenues. Gardens and parks throughout the area will provide residents and guests with a strong connection to nature and a pleasant quality of living. Dana Holdings hopes the Tesla City concept will solidify Belgrade’s position as one of the most important capitals in the region while giving its residents a new symbol of hope for the future.